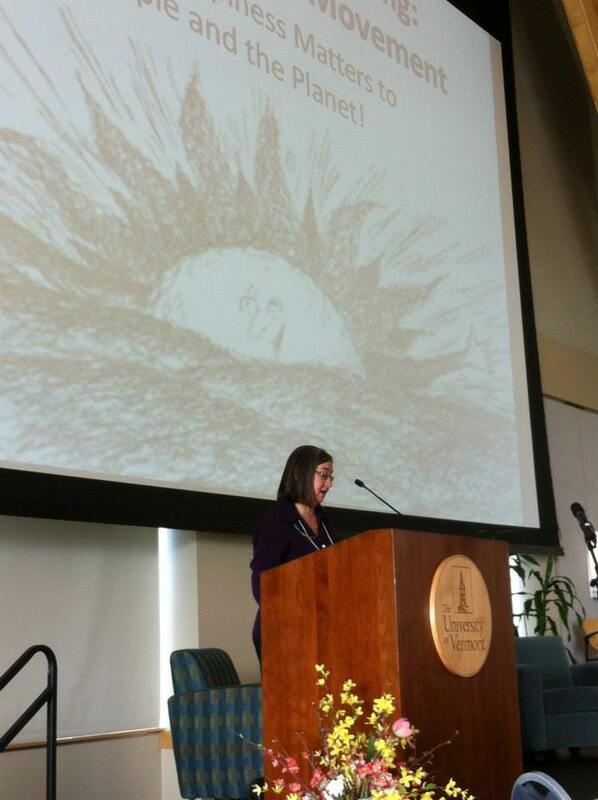 Ginny Sassaman delivering the morning keynote speech at the national gross national happiness conference in Burlington, Vermont. At the Embodied Positive Psychology Conference in late late April, I will be a presenter, this time on The Happiness Walk. I am always honored to share my knowledge and experience with groups who may benefit from my heart felt expressions of invaluable personal and systems information. If you are looking for a guest lay service leader or a speaker for your conference or other event who can address the connection between personal happiness and the vital work we are all striving to accomplish in this troubled world, please let me know. I can tailor my remarks to suit your specific situation or congregation. Wonder work! Thank you so much! Are any of your sermons or talks available online? No, sadly, none are available!! I’ve been thinking I should do something like that, but it hasn’t risen to the top of the list yet. Thank you so much for your interest, and enthusiasm.